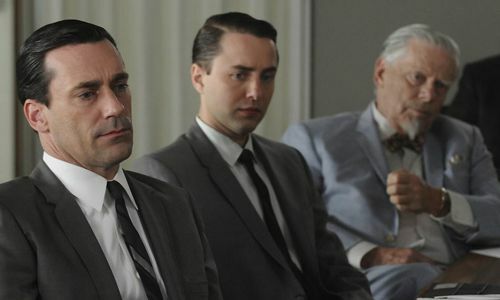 Cultural Wormhole: Mad Men - "Blowing Smoke"
Don Draper (Jon Hamm), Pete Campbell (Vincent Kartheiser) and Bert Cooper (Robert Morse) as their empire slowly crumbles around them. I know that there is one episode left in the season, but "Blowing Smoke" felt like a season finale. The episode ended with a feeling of uncertainty, yet with a direction more towards a positive outcome. Yes, SCDP is having to down-size, resulting in the firing of big chunk of the staff, but thanks to the partners ponying up some money, the bank has granted them a loan to keep the company afloat for another six months. Pete didn't have the money and attempted to get a loan from the company from Lane, only to find out that Don had secretly paid his share. Pete has had to take several hits for Don this season, most notably was the loss of the military contractor account, so Don could avoid the FBI learning about his false identity. Also, I think that Don does truly value Pete as an account man. Pete is definitely doing more to keep the business running than Roger has. Don's bold move of the hour was his unauthorized proclamation to the press that SCDP would no longer work for any tobacco companies. His reasoning was far from altruistic. This was an attempt to get the company noticed and to make waves. Mission accomplished, but the partners were understandably upset by the move and by not being consulted before hand. I liked Peggy's callback to the her stunt involving the hams from the season premiere. Don's stunt wasn't too dissimilar from her and Pete's. They certainly preyed upon our expectations with the fake "Bobby Kennedy" phone call. About ten seconds into the conversation, I started to note that "Bobby" sounded too much like a caricature. Sure enough, it was Ted Chaough, Don's wannabe equal in the creative ad world. I wonder if he'll continue to be a thorn in side of SCDP next season. The return of Midge was a bit odd. She's a heroine junkie now and tracked Don down for some money to feed her and her new husband's addiction. The incident seems to have sparked Don's bold move, but I think more than that, he helped him realize that he has changed too, but hopefully for the better. He had his own addiction battles with alcohol, but he has made decisions to correct it. Life for Sally Draper with her tyrannical mother has not improved. Her psychiatrist is happy with Sally's progress, but Betty continues to find ways to set it all back. She gets angry when she catches Sally hanging out with creepy Glen and this sparks a conversation with Henry about moving. Needless to say, Sally becomes very upset by this. If this had been a true season finale, I would go into a little more depth about how the rest of the show had led to this conclusion. However, we've got one more hour and that's plenty of time to really shake up this show. That's one of the best things about 'Mad Men', it continues to evolve.